After a coaching career that has spanned nearly 50 years, Hart High School head coach Steve Neal will retire at the end of the 2019 season. Jake Foster won the boys honor after taking 4 gold medals at the Ohio High School Division I State Championship meet. NC State recruit Katharine Berkoff, who finished in second with a 59.83, swam the 8th-fastest time in the world this year. Regis Jesuit’s Will Goodwin (above) leads the state in the 100 breaststroke in 200 IM so far this season. 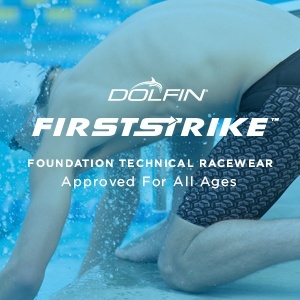 Matt Fallon 0f Somerset Valley put up the 2nd-fastest 200 breast in 15-16 age group history during day 2 prelims of the 2019 YMCA SC National Championships. 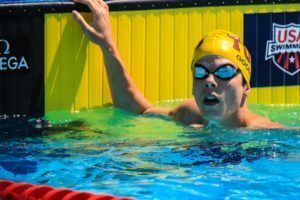 Ross Dant of Hickory defended his 1000 free title from 2018 and broke the YMCA meet record by over 5 seconds in the process on the first day of the championships. Dare Rose and Mariah Denigan set sectional meet records on the closing day of the Indy sectional meet, both in the distance events. 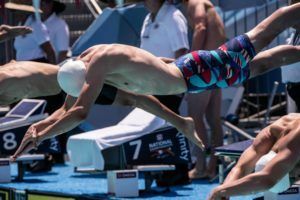 The third day of the Indy Sectional meet, national team members Devon Nowicki and Kaersten Meitz graced the top of the podium in the finals session. Conroe The Woodlands will look for their third-straight 6A girls title, this year returning one of last year’s powerhouse sister duo. In 2017, Lucie and Lillie Nordmann combined for two relay and two individual wins. 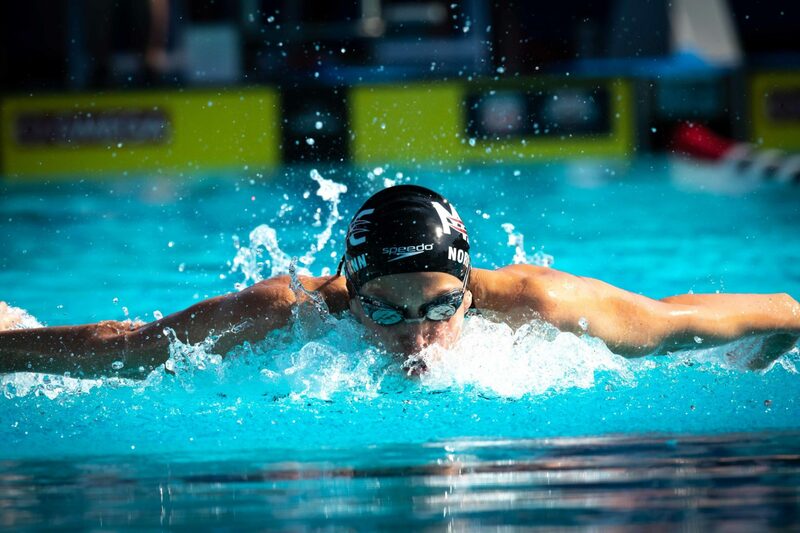 Lucie has since graduated and is in her freshman year at Stanford, vacating the 200 free and 100 back events. Younger sister Lillie, now a junior, will step into the 200 free, where she’s the top seed incoming. Nordmann should be part of perhaps the race of the meet in the 100 fly. Last year’s champ Dakota Luther is graduated, but last year’s runner-up Emma Sticklen will do battle with last year’s third-placer Nordmann. Katy Taylor’s Sticklen was a good nine tenths faster last year, but the two now hold lifetime-bests within a few tenths: 52.2 from Sticklen and 52.4 from Nordmann. Both came at Winter Juniors in December. Sticklen is the top returner in the 100 back after taking third last year. Another event to watch is diving, where Southlake Carroll teammates Hailey Hernandez and Bridget O’Neil should jockey for the title after going 1-2 last year. Conroe The Woodlands should have a shot to defend state titles in the 200 medley and 400 free relays. They lose stellar splits from the elder Nordmann, but return the other three legs. The big change from a team perspective is Montgomery moving down to the 5A class. That means defending 500 free champ Kaitlynn Sims won’t be competing in the 6A meet. The boys landscape looks much different after the graduation of Jack LeVant. 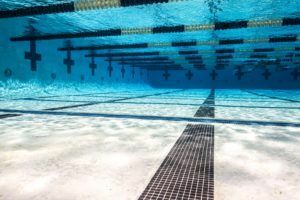 And it’s not just the record-shattering LeVant: every single individual swimming race last year was won by a senior, opening up the field in a big way for 2019. LeVant’s former Southlake Carroll team has won four 6A state titles on the boys side dating back to the official beginning of the 6A class (and the last four 5A titles in the previous alignment, where 5A housed the largest schools), but things could get much tighter this year. Conroe The Woodlands was second last year by 51 points, and they come in with the top seed in the 400 free relay and the 100 back (Tyler Hulet at 49.03). They also have two divers in the mix for the title, though Southlake Carroll returns defending champ Jackson Miller. Houston Bellaire senior Briggs Shiller is the top seed in both the 200 (1:38.30) and 500 (4:26.80) freestyles. Meanwhile the sprints should be exciting. Spring’s Dalton Lowe is the top 50 seed after taking second in 20.31 last year. But Konnar Klinksie was only hundredths back last season, and Klein senior Caleb Duncan has already been three tenths faster than he was in taking 5th last year. 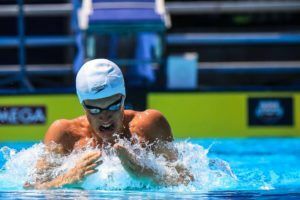 Then Klinksie, the top underclassmen in the 100 free last year, ditched that event in favor of the 100 fly, where he’ll go up against Lowe once again. Lowe was 48.69 last year, but both he (48.66) and Klinksie (48.45) come in with faster seeds already this year. The 5A girls meet, meanwhile, should be heavily impacted by the addition of Montgomery. At the very least, it puts Kaitlynn Sims in striking distance of class 5A state records in the 200 (1:46.80) and 500 (4:42.16) freestyles. Sims’ bests are 1:47.30 and 4:39.52. Montgomery also comes in with the top times in the 200 medley and 400 free relays, and Jojo Daspit is the top 100 free seed (51.12), coming in faster than what it took to win last year. Denison senior Lindsay Looney returns as the defending champ in the 200 IM and 100 fly. Looney went 2:00.54 in the IM and 54.40 in the fly last year – she holds the class 5A record in the fly and is only about a second off the IM mark. 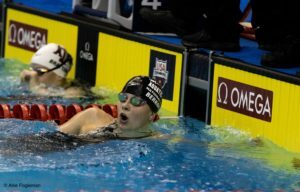 In the IM, she’s technically the second seed behind Frisco Reedy senior Abby Koczo (2:01.92), and Koczo is also the top 100 back seed (55.00). The backstroke should be a great race between Koczo and defending champ Kaitlyn Owens, who won the event as a freshman last year in 55.70. Frisco junior Jadyn Jannasch is the top 100 breast seed after taking second last year. Her 1:02.71 from 2018 sits within a second of the 5A state record. On the boys side, Manvel senior Jack Armstrong returns as the defending champ in the 50 and 100 frees, and has shots at state records in both. 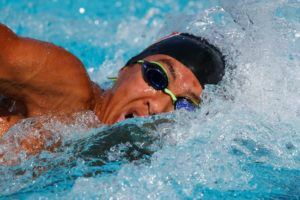 His 20.31 last year is just .03 off the 5A state mark in the 50, and he set the 100 free record in prelims at 44.57. The team points battle was a thriller last year, with Dallas Highland Park besting Georgetown by 14. Georgetown returns senior Greyson Alarcon, who is the top returner in the 100 fly and 100 back. Alarcon was second in the fly last year in 49.26, but has already been 47.81 this year. 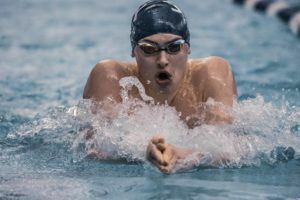 He was third in the backstroke last season at a 50.07, but has already been 48.67 this year. He’ll battle top-seeded Eric Stelmar of Mansfield Legacy. Georgetown also has sophomore Corby Furrer, who is the top returner in the 200 and 500 frees. Furrer was 1:39.93 in the 200 last year to take fourth, plus 4:32.53 in the 500 to take second as a freshman. He also gets a shot at Stelmar, who is the top 200 free seed in 1:39.76. Lucas Lovejoy junior Jed Michael Jones has dropped the 100 backstroke in favor of the 500 free this year. He’s the top returner and runaway top seed in the 200 IM after taking second last year in 1:51.97. His move to the 500 sets up a showdown against Furrer, where the two are the top incoming seeds. Meanwhile the defending champs from Dallas Highland Park bring back senior Henry Wang, who is the top 100 breast seed by almost a second. Wang was second last year. Don’t underestimate Kingwood High School. Correction: Southlake Carroll Men’s Swimming and Diving has won 8 Straight (10 total) HS State Championships.